This year we continued our goal of providing financial assistance to families caring for children with a life limiting illness. It has been a milestone year – in many ways, but to mention two; 2017 was our 10th anniversary and it has been the first year where we have ever exceeded the 100 mark. We have proudly helped a total of 101 families since January. As we look back on the year, what really strikes us is the number of individuals who took it upon themselves to raise funds through sponsorship. Very special to us is that some of these included families that we have been able to support in the past. We’ve had runners, cyclists, walkers, free fallers, hikers and swimmers. Each of them raising funds to help make life a little easier for the families who come to us for help. Essentially they clocked up miles for smiles, because without them we couldn’t possibly have helped so many families or gave them some hope at a time that can often be extremely stressful and frightening. Get a glimpse of how fantastic people have been by clicking on the image below. We are seeing a dramatic increase in applications from families needing support and it is extremely difficult for us not to be able to turn around and help them as quickly as we would like. 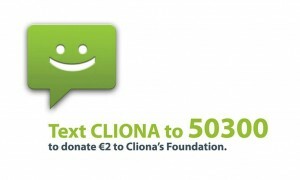 The Challenge for Cliona’s Foundation in 2018 will be to increase the awareness of the huge cost of caring for a child with a life limiting illness in order to get funding to the growing number of families who reach out for our support in a shorter time frame. We would like to thank you for your continued support throughout 2017 and wish you all the very best for the festive season.